Hok Lay Kiong Temple that located on Jalan Kenari, East Bekasi, Bekasi City, West Java is touted as the oldest temple in Bekasi. The temple that used as a place for praying of Confucians is estimated to be more than 300 years old. But Chairman of Hok Lay Kiong Temple Foundation, Ronny Hermawan said not knowing exactly about the age of the temple. Despite hundreds of years, this temple has looked so sturdy. Upon entering the inside of this temple, the smell of incense has been burned. 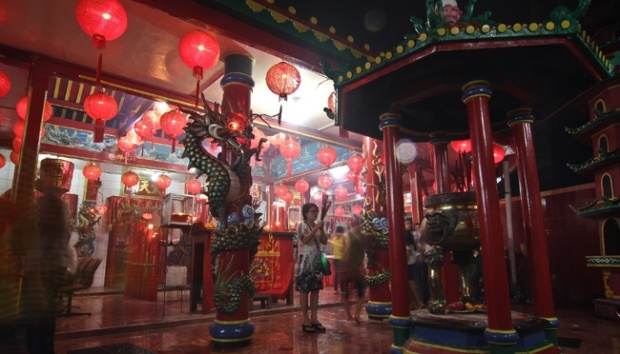 Several people are seen praying in Hok Lay Kiong Temple. Then there are also the officers who clean the inside and courtyard of the temple. This temple is always restored, cared for, and repaired by the foundation. Especially before the Chinese New Year, from the outside building to the inside is also fixed. Before the Chinese New Year, the foundation's board is responsible for preparing everything. The management of foundation must check the building, the comfort, the toilet, and all are fixed. The purpose of checking and cleaning activity, so that during the celebration of the Chinese New Year, the building is good and people who come to pray can feel comfortable. The meaning of Hok Lay Kiong itself is a palace that bring sustenance. This place is believed to bring sustenance to anyone who visit. During the Chinese New Year in mid-February, there will be a series of events. In addition to pray, in the temple there will also be fireworks party. At the time of Chinese New Year, people will pray in the temple, then visit the home of parents and other relatives. Two weeks later, there's Cap Go Meh and a people's march. The general public can watch this for free. The ritual after the Chinese New Year is interpreted as a request for safety and it is believed to provide positive energy throughout the year for the people of Indonesia, especially the city of Bekasi. It is very beautiful temple! really beautiful work! is it permissible to take photographs of the temple?